Somewhere in the cosmos, perhaps, intelligent life may be watching these lights of ours aware of what they mean, Hawking said. Or do our lights wander a lifeless cosmos, unseen beacons announcing that here on our rock, the universe discovered its existence? Ideal Being ceased to be satisfied. in its sleepy gardens above the world. in the bad company of matter? lacking all prospects for eternity? with a thorn stuck in its heel? when it didn’t have one before? 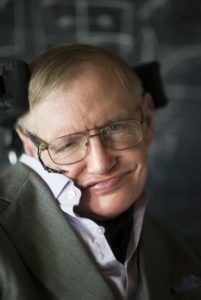 The day Stephen Hawking died earlier this month aged seventy-six we lost one of the great scientific minds of our time. And not just a mind but a spirit so fierce for life he lived more than forty years past the due date he was given when he was diagnosed with Lou Gehrig’s disease in his early twenties. When I heard about his death I didn’t immediately think about black holes and how his theorems helped define their possibility and over the years further ideas of their physical characteristics. No, I thought of a poet whose vision somehow reminded me of Hawking. 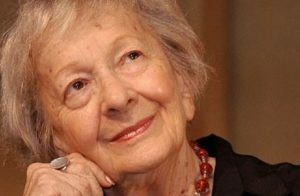 I thought of the Polish Nobel Prize Laureate, Wislawa Szymborska. I couldn’t tell you why I made that connection. I hadn’t thought of it before. Was it her ironic detachment so evident in her poems or her amazement that there is any life here on earth let alone anywhere else in the universe or universes? I don’t know. But my hunch was strong enough I began to go through my collection of her poems and sure enough her fierce attachment to the miracle of life, yet also to the incomprehensible vastness of space and time, provided the link to Hawking. Both of them seekers for what lies at the heart of the mystery of space and time. And this line from her wonderful poem Miracle Fair seemed to capture the essence of a world that could produce minds like those of Einstein and Hawking, the miracle of minds that show the rest of us: the unthinkable/ is thinkable. And her poem Plato, or Why jumped out as a good example of a poem that connects with Hawking’s sensibilities. His mind vigorously searching for clues for what lies behind The Great Silence up on high. Here, now, two more of Szymborska’s poems, Miracle Fair and The Ball. Along with Plato, or Why I dedicate them to the life and memory of Stephen Hawking. This entry was written by Richard Osler, posted on March 27, 2018 at 4:20 pm, filed under Poetry and tagged Stephen Hawking, Wislawa Szymborska. Bookmark the permalink. Follow any comments here with the RSS feed for this post.